Plot Summary: Obi is a young jedi in training. When he and his master are on a misson to protect the Queen they have to land on the Planet of Tatooine; there they meet Anakin Skywalker, a ten year old boy who seems to have amazing Jedi reflexes. 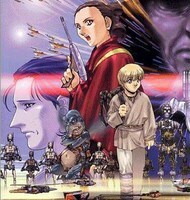 This is the only manga adaptation of the Star Wars Prequel Trilogy, as Episode II: Attack of the Clones and Episode III: Revenge of the Sith were never released in manga form.